Your Engineer Continuing Education solution. Learn on your schedule and in the convenience of your own home or office. 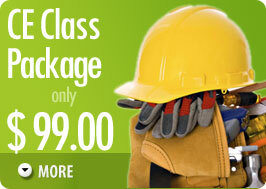 On-Line-Classes is the First Choice of the Working Professional. Tired of Continuing Education "providers" that only provide you with links to Endless Pages of Reading? You'll find our courses are a refreshing change. Our Collegiate-Style Narrated Lectures allow you to Watch, Listen and Enjoy your continuing education classes. See for yourself, try 2 classes for FREE. Thats right. 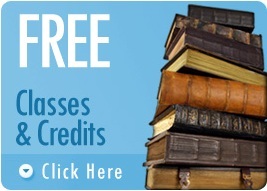 To let you experience the quality of our program, enjoy 2 Classes and 2 Credits for FREE. Course Approval: The Board does not pre-approve specific courses, but does pre-approve course sponsors. Engineers are not required to earn hours from an approved sponsor. However, courses provided by an approved sponsor are assured to be accepted by the Board. Course Content: No specific guidance or restrictions on course content are provided by the Board. The course must have a "clear purpose and objective which will maintain, improve, or expand the skills and knowledge relevant to the licensee's field of practice". •Completion of continuing education courses. •Completion of correspondence, televised, videotaped, audiotaped, and other short courses/tutorials. •Presenting or attending seminars, in-house courses, workshops, or professional or technical presentations made at meetings, conventions or conferences. •Teaching or instructing in Items (1) through (4) of this Rule. • Authoring published papers, articles, or books. •Active participation in professional or technical societies. •Authoring exam questions accepted for use in the engineering or land surveying exams. (5) For teaching in Items (1) – (4) of this Rule, PDH credits are doubled. Teaching credit is valid for teaching a course or seminar for the first time only. Teaching credit does not apply to full-time faculty, as defined by the institution where a licensee is teaching. (2) attendance verification records in the form of completion certificates, or other documents supporting evidence of attendance.These records must be maintained for a period of three years and copies may be requested by the board for audit verification purposes. The Board shall approve other records that contain the information required by this Rule. Course Approval: The Florida Board of Professional Engineers pre-approves providers of continuing education classes. (On-Line-Classes.com) is a Board-approved sponsor in the State of Florida, Provider #0005141. One (1) hour must relate to the Laws and Rules of professional engineers. Sixteen (16) hours can relate to any topic pertinent to the practice of engineering. Engineer Reporting: Florida Administrative Code, state that engineer licensees are responsible for maintaining sufficient records demonstrating completion of qualifying professional development hours for at least two licensure cycles four (4) years. Valid Engineer Course Work: Qualifying Activities for Area of Practice Requirement. (1) Successful completion of college classes. or seminar for the first time only. Teaching credit does not apply to full-time faculty. (4) Authoring published papers, articles, books, or accepted licensee examination items for NCEES. this provision. Credit for this activity requires that the licensee serve as an officer of the organization. PDH credits are not earned until the end of each year of completed service. Units to Engineer PDH: (1) One (1) college or unit semester hour credit is equal to 15 PDH. (2) One (1) college or unit quarter hour credit is equal to 10 PDH. (3) One (1) continuing education unit is equal to 10 PDH. presentations made at meetings, conventions, or conferences is equal to 1 PDH or if teaching, 2 PDH. (5) Each published paper, article, or book is equal to 10 PDH. (6) Authoring accepted licensee examination items for NCEES is equal to 2 PDH. (7) Each patent id equal to 10 PDH. F.A.C. Each hour of participation is equal to 1 PDH, with a maximum credit of 2 PDH for each organization. (1) Title of activity and a description. (2) The date, location and provider of the activity. (3) The area of practice to which the activity applies. (4) The number of PDH credits claimed for each activity. Engineer Record Keeping: It is the licensees responsibility to maintain sufficient records to demonstrate completion of qualifying professional development hours for at least two licensure cycles (four years). Renewal Deadline: Renewals are staggered quarterly, March 31, June 30, Sept 30, Dec 31, based on date of licensure. The first renewal period is due 9 months from the date of licensure; after that, they are annually. Online PDHs: 15 hours allowed - For Professional Engineers, there is no limit on the number of PDHs that can be earned through online continuing education classes. Carryover Allowed: 14 hours allowed - you may not carryover your ethics hour. Engineer Course Approval: The Texas Board of Professional Engineers does not pre-approve or endorse any CEP activities. however, the Board is the final authority with respect to whether classes or activity meets the requirements of these rules. It is the responsibility of each license holder to assure that all PDH credits claimed meet CEP requirements. All State Professional Engineering Boards which have reviewed and/or audited our Engineering Classes have accredited our institution and course curriculum for the Engineering Profession. Engineer Course Content: Courses must have a "clear purpose and objective which will maintain, improve, or expand the skills and knowledge relevant to the license holder's field of practice". At least one PDH must be relevant to professional ethics, roles and responsibilities of professional engineering, or review of the Texas Engineering Practice Act and board rules. Engineer Reporting: Reporting of CPC activities will be made during the license renewal process. Verification of a registrant's CPC records will not be required for the license renewal process, but the board of registration may ask to review such verification. (1) Successful completion or auditing of college credit classes. (2) Successful completion of continuing education classes, either offered by a professional or trade organization, university or college, or offered in-house by a corporation, other business entity, professional or technical societies, associations, agencies, or organizations, or other group. (3) Successful completion of correspondence, on-line, televised, videotaped, and other short classes/tutorials. (4) Presenting or attending seminars, in-house classes, workshops, or professional or technical presentations made at meetings, conventions, or conferences sponsored by a corporation, other business entity, professional or technical societies, associations, agencies, or organizations, or other group. (5) Teaching or instruction (1) through (4) above. (6) Authoring published papers, articles, books, or accepted licensing examination items. (C) Serving in other official positions. (1) One college or unit semester hour - 15 PDH. (2) One college or unit quarter hour - 10 PDH. (3) One Continuing education unit - 10 PDH. presentations made at meetings, conventions, or conferences - 1 PDH. (6) Each published paper, article, or book - 10 PDH. (Not to exceed 5 PDH). (8) Each patent id equal - 15 PDH. (9) Other activities shall be credited at 1 PDH for each hour of participation in the activity. Engineer Recordkeeping: The license holder is responsible for maintaining records to be used to support credits claimed. name and PDH credits earned. The license holder must submit certification that CEP requirements have been satisfied for that renewal year with	the renewal application and fee. The registrant should maintain these records for a period of 3 years and copies may be requested by the board for verification purposes.